Brokers say it's the best time to buy as mortgage rates saw their biggest single week drop in a decade. They say capitalizing on the new, low rate could save home-buyers thousands of dollars. SAN DIEGO (KGTV) - Mortgage brokers spent the past week calling and emailing clients around San Diego, telling people it's time to buy. "Whenever I see a rate dip like that, my first reaction is to call everyone as fast as I can," says Broker Scott Davenport. "I try to get a hold of as many people that have been on that fence to jump on it as quickly as they can." The frenzy started when mortgage rates dropped .22% on March 27, to 4.06% on a 30-year fixed rate mortgage. It was the biggest single-week rate drop in more than a decade. "That could mean a savings of hundreds of dollars per month," says Davenport. "Or even hundreds of thousands of dollars over the course of a 30 year mortgage." Analysts say the drop came after the Federal Reserve said it was worried about the economy slowing down. It caused concern among investors, which led to good news for buyers. "It's not gonna last," says Davenport. "You never know where the market's going to go. I expect rates to stay low through the summer, but at the same time, I don't expect them to stay low for long." 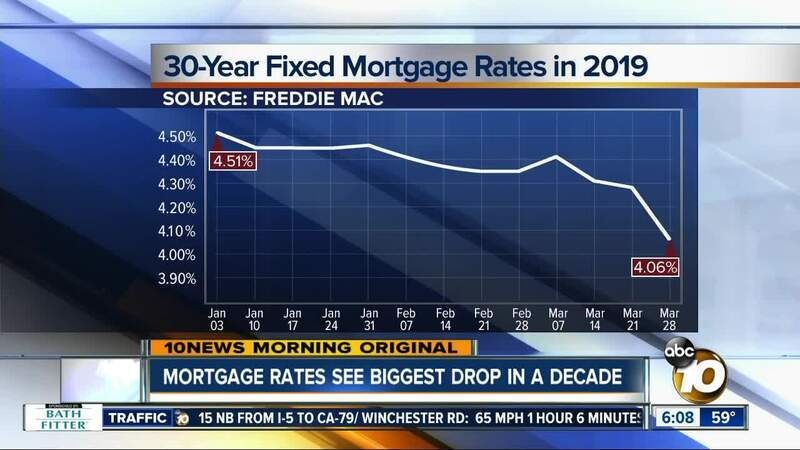 Rates hit historic lows in 2012, around 3%, after the recession and housing bubble burst. Davenport says he doesn't see conditions that would create rates that low any time soon. That's why he's telling people to take advantage of the current rate near 4% now. He says anyone thinking of buying, or of refinancing a mortgage should get in touch with their broker now. "Have the numbers run. It's something we do all the time," he says. "We can see if there's a benefit for a refinance with it, with the rate drop for you right now. Or if you're looking to buy a house, get pre-qualified first."